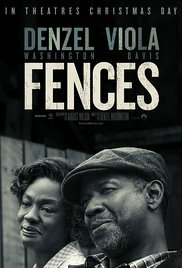 Description: Fences is the story of Troy Maxson, a mid-century Pittsburgh sanitation worker who once dreamed of a baseball career, but was too old when the major leagues began admitting black players. He tries to be a good husband and father, but his lost dream of glory eats at him, and causes him to make a decision that threatens to tear his family apart. Coming Soon: La La Land, Hidden Figures, & Rogue One.